When was the first Medieval Motte and Bailey Castle built? The Medieval Times encompass one of the most violent periods in the History of England are are epitomised by the castles of the Middle Ages. The development, architecture and building of these great fortresses changed as time progressed, influenced by important historical events such as the crusades and the technology of siege warfare. This page provides interesting and important information about the Medieval Motte and Bailey Castle built by the Normans. What is a Medieval Motte and Bailey Castle? The Castle foundations or mounds - Two mounds of earth were built consisting of a high and extremely steep mound which was called the Motte. The Motte had very steep sides and a Tower was built on the top of it. A much shallower mound was also built which served as the foundations of the bailey. The Bailey was a defended yard, surrounded by the ditch, which contained barracks, stables, livestock and other buildings for storing food, weapons and equipment. When the timber Medieval Motte and Bailey Castles were completed many were covered in white plaster - which made them look as if they were made of stone. The first Medieval Motte and Bailey Castle was built at Mont Glonme on the River Loire in France in 990 - so the Normans were used to using the castle to dominate their tenants under the feudal system. The Normans also brought feudalism to England. Prior to the Norman invasion in 1066 led by William the Conqueror there were hardly any castles in England and the ones that did exist were built by Norman lords who were friends of King Edward the Confessor. The earliest Motte and Bailey castles were simply a wooden blockhouse placed on a mound and surrounded by a stockade hence the term of Motte and Bailey castles. The rapid construction of the Motte and Bailey castles enabled the Normans to control and subjugate the conquered English. Norman soldiers manned the Motte and Bailey castles and were able to take on any attackers. The wooden Norman Castle was also used to safely store supplies and equipment together with their horses. Soon the Norman lords and knights began to build in stone, which would better resist fire and the assaults of English rebels. The stone castle consisted at first of a single tower called a Keep, square or round, with thick walls, few windows, and often with only one room to each story. The outward mark of feudalism was the castle, where the lord or knight resided and from where he ruled his fief, or estate. Feudalism was based on the exchange of land for military service. The Norman lords were given English land by their Norman overlord William the Conqueror as a reward for helping him to conquer the English. 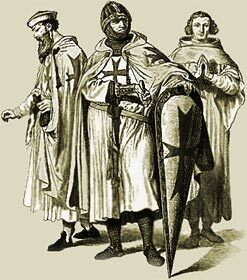 Under the Feudal system the Norman vassals ( the knights and lords) who were awarded land in England swore an Oath of Fealty to their lord and provided fully equipped soldiers under the Feudal Levy. Serfs in Medieval Times were peasants who worked his lord's land and paid him certain dues in return for the use of land. When the land changed owners the peasants or serfs were obliged to work for the new owners - the Normans. The Normans used the Motte and Bailey castle to intimidate the local population. These great castles on high mounds must have easily intimidated the English. The Motte and Bailey castles gave the Normans a home and a power base and enabled them to introduce Norman feudalism to England. As many as 1000 Motte and Bailey castles were built in England by the Normans. The Medieval Times website provides interesting facts, history and information about these great fortresses and castles of Medieval times including this section on Medieval Motte and Bailey Castle. The Medieval Times Sitemap provides full details of all of the information and facts about the fascinating subject of the lives of the people who lived during the historical period of the Middle Ages. The content of this article on Medieval life and times provides free educational details, facts and information for reference and research for schools, colleges and homework for history courses and history coursework.